Australian model Nicole Trunfio’s hot poses in magazine spreads did cause a lot of interest before, but this time the model is seen stripping for an exclusive subscriber only version of the Elle magazine. She is seen in multiple poses stripping to promote awareness on parenting and breastfeeding causes. The model has a son Zion through her fiancé Gary Clark Jr, and Zion was also seen in a few poses. As per initial reports, the model attributed the shoot to her motherly values and it’s also said that the shoot was quite natural and wasn’t preplanned. Nicole has been associated with international brands such as D&G, Dior, Versace, Gucci etc, and is currently the ambassador for Ulta cosmetics. 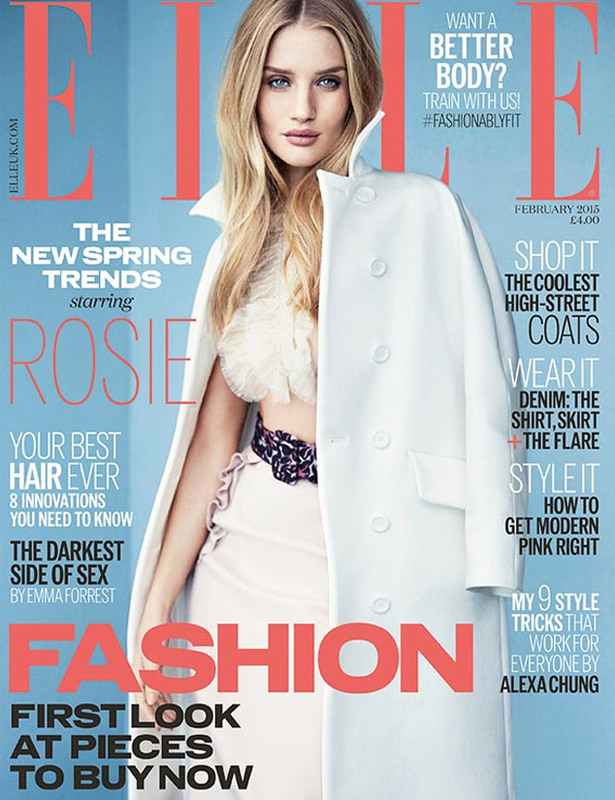 Elle UK magazine’s February 2015 edition’s cover page features Rosie Huntington Whiteley. After enjoying a lot at the new year parties, Rosie looked very beautiful. Jessica Simpson latest Instagram post as she is very positive mindset. The “Dukes of Hazzard” hottie, who has famously struggled with her weight for years, happily shows off her fit physique in the series of snapshots while wishing her loyal followers a happy holiday. On Monday afternoon (Dec 22), Hilary Duff hit up a few stores in Los Angeles. The “So Yesterday” singer carried an iced tea beverage as she tramped out of one store and headed into another while paparazzi looked on. Hilary and her husband Mike Comrie separated, though things have been pretty friendly as of late. “We have a 2-year-old together. We love each other. Obviously it wasn’t a rash decision that we made. We really are just trying to figure out how we are the most happy – whether together or apart – and we’re doing it as lovingly as possible.” She told in health magazine. Jessica Alba is a very famous actress but now she is proving herself as a successful businesswoman also. She attended a press meet with the Self Magazine panel and shared her experience about starting and being a part of The Honest Company. She also told how it feels like to manage a company. The hot model Kendall Jenner who is not afraid to show off her amazing body had decided to strip down for her cover shot for a magazine. She is working with a famed photographer Mario Sorrenti. She insisted that being in her birthday suit wasn’t a problem for her.